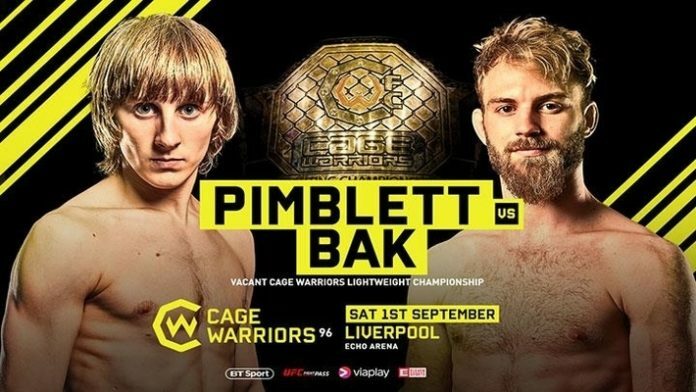 Cage Warriors 96 is set to be a historical event, as former Cage Warriors featherweight champion Paddy Pimblett takes on Søren Bak for the Cage Warriors lightweight championship. Paddy Pimblett aims to be the first fighter since Conor McGregor to claim two titles in separate weight classes, but he faces a stiff challenge in Søren “The True Viking” Bak. Bak, who currently has an impressive 10-1 record, believes that his fighting style matches Pimblett’s perfectly. Søren Bak claims that he sees huge holes in the Liverpudlian’s clinch and ground game. Paddy Pimblett has faced huge criticism and backlash after his decision to turn down an opportunity to fight for the UFC at UFC Liverpool. The 23 year-old fighter wanted to first achieve his goal of becoming a two-weight Cage Warriors champion before moving up in his flourishing MMA career, and he now has the opportunity to realise his dreams. This event is poised to be an electric night of fights, and with both fighters involved in the main event eager to prove their doubters wrong, we can expect fireworks inside Liverpool’s Echo Arena. Jonas Billstein defeats Mick Stanton via submission (RNC) at 3:27 of Round 1 to become the new Cage Warriors Middleweight Champion.